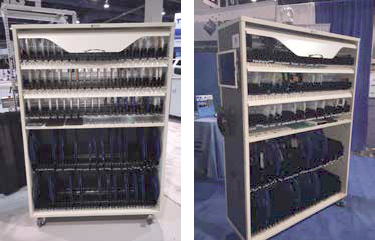 DEERFIELD BEACH, FL — March 2016 — Inovaxe announces that it has been awarded a 2016 NPI Award in the category of Component Storage for its SMART InoAuto Mix part Storage System. 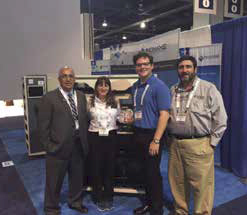 The award was presented to the company during a Tuesday, March 15, 2016 ceremony that took place at the Las Vegas Convention Center during the IPC APEX EXPO. The InoAuto SMART Mix part cart stores 480 of 8 mm equivalent 7" reels and 160 of 8mm equivalent 13" reels. It also contains a 42" by 15" SMART Tray to store printed circuit boards, waffle trays, and or bulk materials, along with an option for SMART Tube storage on the backside of the unit. One platform can accommodate multiple part sizes. The InoAuto Two Bay stores 1,120 7" SMT reels and the InoAuto Single Bay stores 560 7" SMT reels. All of the SMART systems are equipped with sensors and LED indicator lights, along with the InoAuto Locator software, and respond as if the reels have RFID on them. The operator will simply barcode scan the part number and quantity on a reel and place it into an empty Single Package Single Location slot. The InoAuto will report the position of the part to its database automatically. The InoAuto Smart ultra-lean material handling systems will allow you to find a part in less than four seconds and return a part in less than eight seconds. The InoAuto Smart system will reduce material handling time by more than 70 percent, reduce reel storage space by 60 percent, reduce travel time by 60 percent, increase inventory accuracy and operator efficiency. The carts are mobile, store 560 reels in 0.23m2 or store 1120 reels in 0.42m2, and the ROI is less than six months. Front and side views of the InoAuto SMART Mix cart. For more information about how Inovaxe’s innovative material handling systems and services can improve your inventory accuracy and reduce your labor costs, visit www.inovaxe.com.